First, my sincere thanks to Kiran & Samad who helped me a lot while making this image. 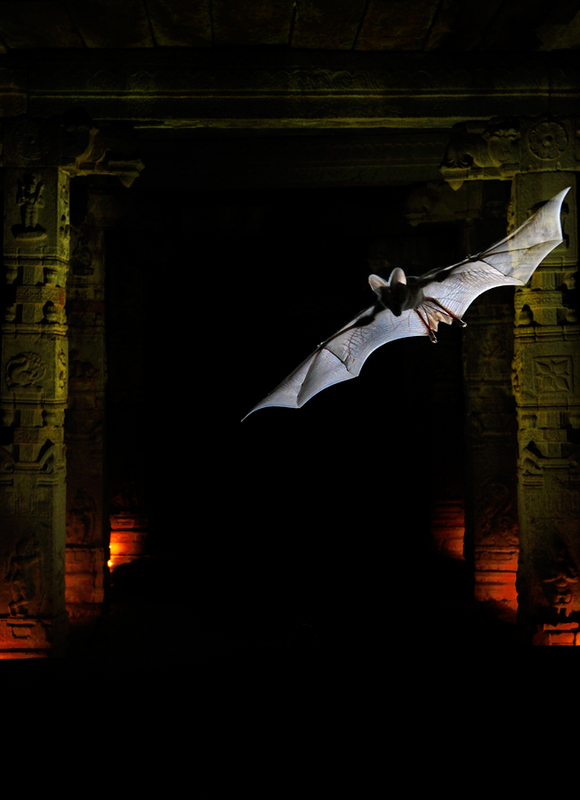 While working for the book on Daroji ("Daroji - An Ecological Destination") we spent good amount of time trying to photograph these bats in one ruined temple of Hampi. Needless to say we need some special techniques and equipments to make images of them at night. We tried to work out our lighting condition such that the habitat (the temple ruin) and the mood is also gently shown along with a flying bat. We thought lighting everything using flash would kill the mood but we wanted a gentle flash on the bat. So carefully wired flash in such a way that only bat will be lit by the flash. To light up the piller and ceilings we used candle lights and oil lamps (in retrospect I think that wasn't a good idea). But then it wasn't reaching at all. So thought of light painting the pillers using torch light. We set up the exposure at 3 seconds. The entry point of bats were guessed and reflective infrared triggers were wired to sense its flight in the night. Flash would go off for about 1/250sec but the shutter would remain open for 3 seconds. During this 3 seconds interval (after the bat got exposed) I would sit in the middle of the darkness in the frame and light paint the pillars and ceilings using a warm torch light. I have also another image below. I must confess however that the results did not match the efforts that we put in. However, it was a huge learning in terms of pre-visualizations and working complex/careful settings that we needed to use. All these experiments with remote triggers taught me an important lesson - while we can eventually master the technical challenges and 'get the subject in frame' it will need deeper further thought process into pre-visualizing how can we fill our frames with life and emotions when we use such unmanned techniques. I hope to focus on that aspect of making images using remote triggers in the future. It will be an enormous challenge. If you have reached reading the description till here thank you !! Excellent execution Ganesh. One of the best staged up artificial lighting set up for 'nature photography' I had come across. I liked the combination of colours here and actually feel the candle light colours add to the image. While there are few mixed thoughts on my mind about this image, it still is a winner overall. Thanks for sharing and its inspirational to see you making such great efforts to take your self to next level each time. i'm speechless, ganesh. simply pre-visualizing the complexity of set-up, your thought process 'n all the efforts are more than i can comprehend! genial, all the way. indeed, the finest ever. i think, the hint of other elements adds a lot in balancing 'n adding up interestingness across the whole frame. Ganshi, I love the second image even more, I may be completely wrong here as I have no experience in doing these kind of work, am guessing the flash which lighted up the bat was placed on the ground and was facing upwards. Was it possible to set up another flash to light up the face of the bat as well, may be one from the top side or one facing the bat's face with an intensity which would not have reached the pillars ? I know you have definitely thought of all these possibilities, the reason am saying this is the eyes of the bat would have generated further impact. I know multiple flashes can be triggered using the remote device, was it possible here ? I know its easier said than done with the bat too flying at great speed....I kind of liked the red tones at the bottom. One more thing, could you have light painted for a longer time, for more yellow and more details of the pillars ? For more uniform light distribution I mean. Another 3 seconds may be ? That probably would have illustrated how with time a busy temple of Hampi is now left ignored by human civilization, the only visitors or residents are the bats. Am thinking of a mood which narrates the story of man's wonderful creations lost in time. I know very well may be am expecting too much as what you have achieved here itself is too difficult to achieve. Hey Nilanjan, I am sure we could have done better than this had we tried this for a few more days. We did this one evening planning plus photography in pitch dark night with torch lights (no electricity in the ruined temple). We were also told a few days back a dog died inside the temple due to a cobra byte and we were told to be careful. It appears sometimes bats would drop down and snakes are there to catch them. The musty odor was difficult to tolerate and I started developing wheezing. The environment was tough for photography and we were not prepared to work in that condition. We did think about the front lighting. There was a challenge with front lighting, it would lit up those pillars in the front which I don't wanted to do. The flashes were wired at an elevated position on a ladder (not visible) so that it is not in the coverage area of the lens to avoid haze. 3 minutes was kind of a compromise. Had I exposed it longer the pillers would show up strongly on the wings (see the translucent wings and pillar at the back in the second image). We took too long to set up infra red triggers. Initially camera would fire however before camera could expose the bats were out of the frame (yes these bat fly very fast, setting the focus was another challenge). It took some calculation to get them in frame by then it was getting very dark. It was tough to work in pitch dark using just torch lights. Thanks friends for your views.. Indeed a Masterpiece from the Master....the image seems to me stills from Hollywood horror movies..
For me, both the images are just AWESOME. Can imagine the amount of efforts involved in capturing these. The transparent wings are too good in the second image and like the compo in the first. Lot many to learn. Many thanks for sharing the information, challenges and the technique. Second one is amazing. Ghost who walks (flies). By the way Congrats to you and VMR on the book. Where can I buy a copy ? can it get any better than this! As photographers we all dream of taking such pictures but to actually pull it off is crazy if I may use the word. I recall a book about the origin of universe "first three minutes"..written by stephen weinberg where he describes what happened during the first three minutes after the big bang. A collosal set of events, convergence, divergence and all the tumult. Your set up was for three seconds and in that a whole new universe came into being. You said three words in the description..temple, ruin and habitat. At the end of the shot you took away the ruin and re-installed the deity of life. The picture is a lovely example of technical elegance, pre-visualisation as you said and the never say die attitude in creating what one feels possible. about some more facets of the shot which appeal to me is its strong architectural and heritage appeal. Like Nilanjan I too like the second one better mainly for the aspect ratio of the frame and the bat. To me, this image is very personal. Bats used to live in storage rooms in our native and i used to observe them when i was a kid. I have seen them in few temples as well. I liked candle light, slightly golden colour might add IMO. The kind of impact your images has is just remarkable. Thank you for sharing the story and the image master. My learning from this is more than just this image and your write up. I would personally meet you and express my views on this. I'm just digesting what you have done here now.